days after an autism diagnosis." Even if you are past your first 100 days post-diagnosis, I'd encourage you to take a look. I'm about halfway through reading this and there is great information for everyone. Also included is an action plan, forms and information on local help. If you haven't checked out the Autism Speaks website, it is a wealth of information. Remember the show "Batman" and how they would head to the 'bat cave'? We've recreated the bat cave for Nathan. He's always had his bed stuffed full of animals, pillows and blankets. He hardly uses any of them, but he's constantly surrounded by them. He can't sleep in a tidy bed. We were given two suggestions. One--weight a few of his animals with rice or beans to make them heavier. Many 2E kids like the weight on them to help them feel anchored to the bed. Two--curtain off his bed so it's totally dark. Since he's on the bottom bunk, that one was easy to do. We haven't gotten around to weighting his animals, but we did curtain off his bed. 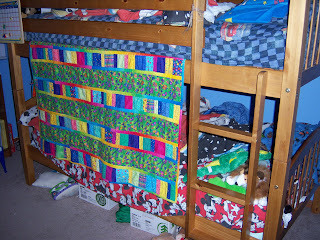 We took his baby quilt (he loves the colors and patterns) and hung it up for him. We asked if he wants the head and the foot of the bed curtained off as well, but he has declined the offer thus far. I've started sending him to his bed to calm down if he gets too upset. We have repeatedly explained that it's not punishment, it's giving him a chance to relax so we can help with whatever he needs. It does seem to help him calm down. I don't think it's the dark since the ends are open. It's not all that much darker in there. I think it's the idea of being secure inside walls. 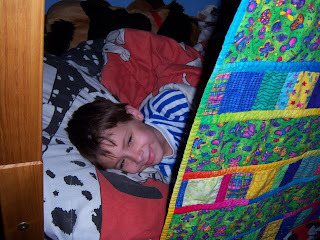 Here's a picture of Nathan waking up in the 'Nathan cave'. We've noticed an interesting thing occurring over the past several weeks/month. Nathan's appetite has grown at a staggering rate. Last night, we were out for dinner and he ate almost the entire meal. 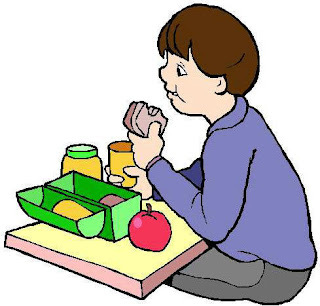 His lunch box comes home almost empty each day...last year they wouldn't let him eat anything else from the lunchbox until he ate half his sandwich. Often, he'd eat only 1/4 of a sandwich for his entire lunch. I honestly don't know if it's a growth spurt or if we can attribute it to allergy shots (and removing milk from his diet) or if the supplements are helping. Whatever it is, it's a new phenomena for our family. We've always used the rest of Nathan's food to feed the hungry older brother or split a plate between him and his little sister. While I have to pay more attention to the amounts I cook and server, it's actually nice to see all my children sit down and eat a meal. Not sure how long I can count on this lasting, but each time it happens is a real blessing to me. I'm hoping that Nathan can put a little meat on his bones.